How long have you been an advocate of ‘movement marketing’? Since the early 1990s and I was owner of an advertising agency in Stockholm, I was grappling with the idea that advertising sometimes forces actions. But how do you drive behavioural change? Most of our clients wanted purpose branding, because consumers demanded more from their employers and from the brands they bought. I felt purpose was too theoretical and focused on the company not the consumer. When we started working with Ikea and Ericsson Mobile phones outside Sweden, I tested the idea of movement marketing. 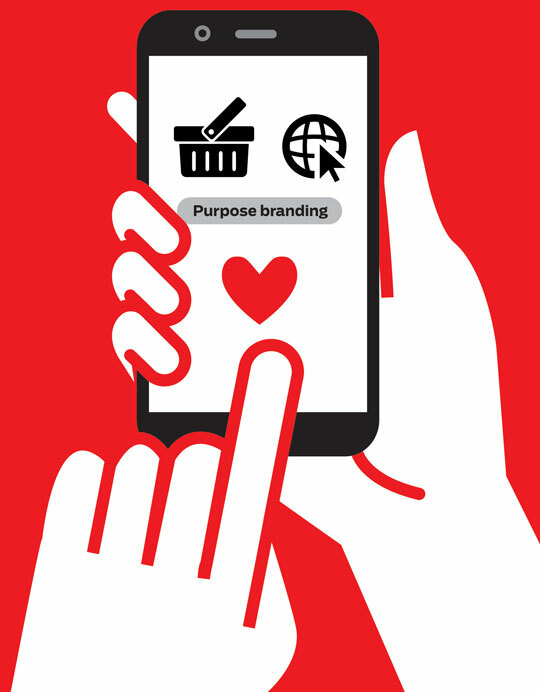 It carried purpose to both employees and consumers with much more power than purpose branding. How does it differ from more traditional forms of promotion? We’re living in the golden age of movements — 87 per cent of Americans will purchase a product, because a company advocates for an issue they care about. A recent study by Gallup said that 36 per cent of Americans have felt the urge to organise or participate in a public protest. The new wave of movements is being led by the millennials, who have been dubbed the crusader generation, a whopping 94 per cent of whom want to use their skills to benefit a cause, and 77 per cent have already gotten involved in charity or change-making, according to Forbes magazine. Unlike 99.9 per cent of brand marketing, joining a movement makes your message unforgettable and sticky. As the UK broadcaster Channel 4 recently discovered, 60 per cent of 16- to 24-year-olds claim to notice ads more if they deal with important issues. The most successful businesses tend to have both. Brand purpose is about your company, whereas, movement marketing is about your customer (and employees) and what’s important in their lives. A movement sells products by firstly connecting with people around a cause they’re passionate about at a time when attention spans are waning. To the consumer the message is inspiring, we are going to partner together to change the world. Advertising, on the other hand, conveys bold and principled declarations to the world: “We’re committed to X. We believe in Y. We care passionately about Z.” Unfortunately, in the end, advertising all starts to sound like generic ad-speak. If you want to transform the culture and mindset of an organisation, a movement inside generates more trust, creativity and motivation than top-down mandates from the C-Suite. Movements move passions to move people to move products more effectively than advertising campaigns. What advantages does it offer over other approaches? How do you engage with consumers that don’t watch TV or read magazines and engage with digital fleetingly? Movement is one powerful tool in these fragmenting timings. It helps our clients not only create purpose-driven brands, but Movement is so much easier to activate in marketing campaigns that drive measurable results. Some movements are noble and aim to change the world while other movements are more playful and where your big idea is embraced by pop culture. Both are ways of amplifying your big idea. The business value of mass engagement by culture includes earned media on top of paid media and greater penetration, conversion and loyalty through passions and word of mouth. What level of resource is required to start a movement? What scale of organisation is this approach best suited to? Movement Marketing is smarter and cheaper. When you advertise on TV, your market share goes up. When you stop, it falls. Movements are sustainable and rely on all platforms rather than traditional advertising. Advertising requires large media budgets. Movements are sustainable and require much less budget than traditional advertising and are 10 times as effective. Is there any evidence of a wider movement towards movement marketing? Nike, highly sensitive to the nuances of youth culture, knew this very well when they chose to honour Colin Kaepernick the iconic symbol of the modern civil rights movement. In taking this action, Nike fired up its base, reminding millions of fans why they love the brand and at the same time disenfranchised others — but [ultimately] grew their market cap in the process. One thing Nike might have prepared better for was the backlash against the brand. Rather than only feature Kaepernick in their ads, they should have told those against the idea to donate their Nikes to families in need instead of burning them. How does a brand or organisation take its first steps towards movement marketing? What preparation is required behind the scenes? 1. What is the enemy? What is the monster you are rallying the village against? This is not your competition, but the motivating factor that will inspire your people to join your cause. 2. What do you stand for? An equally powerful question to be answered. You can’t only be against something, you also need to become an evangelist for something. 3. Define the change you want to make. This will include the behaviour you want your consumers to have in relationship to your brand, and/or the social or cultural change you want to drive. This change should be relevant to your business challenge. 4. Understand your target people. Why do they behave as they currently do? What is important to them — in the category and importantly, in life? 5. Be purpose inspired and benefit driven. People long to be part of something bigger than them. As such, Big Ideas that are true to your brand purpose have a strong potential to become a movement. 6. Insightfully provoke a discussion. Your goal is to overcome a state of complacency. This requires you to turn a deep human (vs product) insight into a sharp instigation that stirs your audience’s souls. Scott Goodson is CEO at New York headquartered StrawberryFrog.